Snake – a most informal photo – with A. P. Slew. By Laura Battles. He couldn’t race, couldn’t be ridden, wasn’t worth breeding to. Many people would say he had nothing to give. His dam was by the good broodmare sire Fortunate Prospect, but his sire had no business in the breeding shed. At some point early in life, the colt had broken a front ankle. He was lucky that it fused and he survived, but he could never race. Neglected and malnourished, he was stunted and oddly shaped. Nobody ever provided him any training or experience. Why bother? 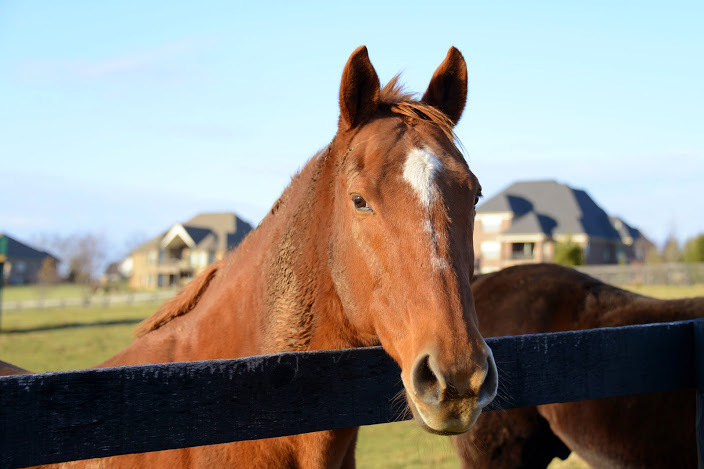 At four years old, the colt was one of the 177 neglected horses seized by the state of New York from Ernie Paragallo in 2009, resulting in Paragallo’s conviction on multiple counts of cruelty to animals. The Columbia-Greene County Humane Society needed homes for those who survived, including the nameless four year old colt, lopsided and unridable, who seemed to have nothing at all going for him. Who’d want such a horse? 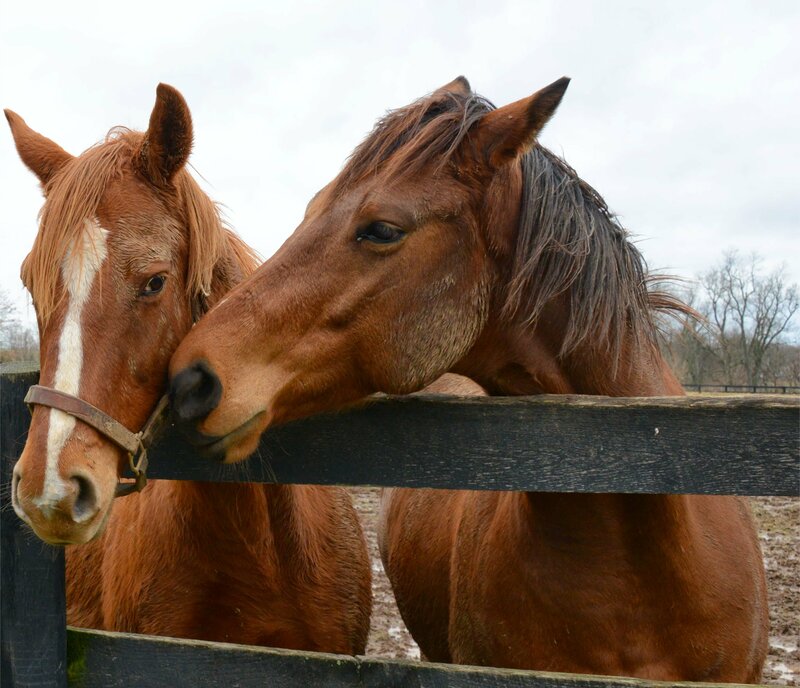 Old Friends was among the many people and organizations who stepped up to provide homes for these horses. Given a list to choose from, we picked Prospect Street, a nine year old daughter of our much-loved Fortunate Prospect. Her damsire being Exceller, she was the obvious perfect choice for us. Arrival at Old Friends, April 2009. Photo by Tim Ford. When the van arrived, to our surprise it held, not a mature mare, but an undersized, peculiar-looking colt who seemed much younger than his four years. Where was Fortunate’s daughter? But it turned out Prospect Street had not been among the survivors on the list. This was her son who’d been identified under her name since he’d never been given a name of his own. At least, the Columbia-Greene Humane Society, New York state officials and volunteers who pitched in to help these horses thought this was Prospect Street’s son. No one could be absolutely sure. So “no-name,” thin, stunted—he was about the size of a yearling, his body too small for his head—undeveloped on the side with the broken ankle, and covered with skin fungus, came to live in Kentucky with Old Friends. What a mess he was! Hi! July 2009. Photo by Beth Shannon. But he was sweet-natured. Despite the hardships he’d experienced in his short life, he had no distrust of people, only a foal-like curiosity. His soft eyes, cute face and childlike openness to new experiences quickly gained our affection. 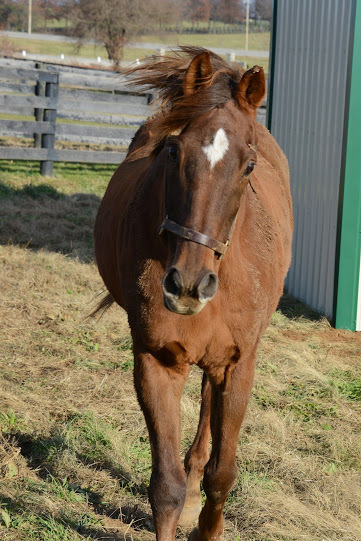 Old Friends doesn’t breed and has no foals, and little “no-name” was the closest thing to a baby we had. From the beginning, we found he had a lot to give. For one thing, the fun of learning about food. Starved horses will eat their bedding, and he didn’t know the difference between hay and straw, but with encouragement he quickly realized hay was yummier and straw was great to sleep on. He had no notion what a carrot was. Why should he put that hard orange thing in his mouth? But when he did, oh boy!! For weeks we had huge fun finding him new treats to try, horse cookies, peppermints, apples, and he delighted in the variety of wonderful new tastes he’d had no idea were in the world. For a little while he hoped everything in a hand was a treat, not to mention buttons and buckles, but he didn’t become a grabber. He figured it out for himself. He couldn’t stay “no-name.” So a little creative thinking discovered something else he had to offer: a fund raiser contest to name him. The entry fee donations benefitted his fellow residents, and he also got an apt name, contest winner Fred Jones’ inspiration from the film Escape From New York. The Jockey Club even agreed to register Escapedfromnewyork, on the condition we geld him, since without absolute certainty of his pedigree he could never breed. 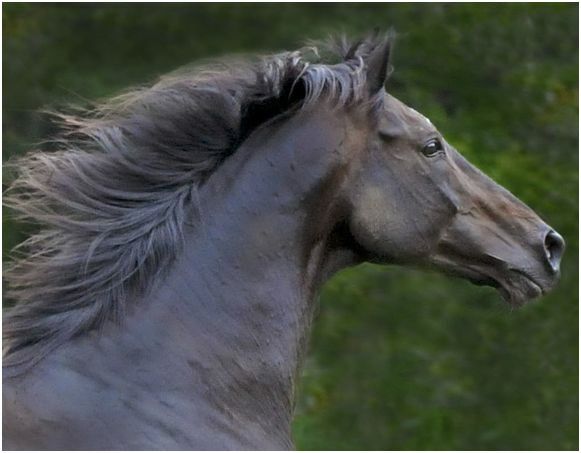 Of course, we geld the male horses who haven’t bred or undergone the hormonal changes into stallionhood. It makes life easier for horse and handlers, and it allows them to live with companions. Since horses are herd animals, instinctively they feel more secure in groups. Escapedfromnewyork, summer 2009. Photo by Beth Shannon. Escapedfromnewyork recovered from the minor surgery quickly and soon was bouncing around, playful with the new energy that proper nourishment gave him. By then, he’d gained not just a name, but a nickname from former film critic Michael, who called him Snake after Kurt Russell’s character in the movie. Snake also put on an astounding growth spurt. He gained size, his coat became glossy, and with the right hoof trim to help his fused ankle carry his weight better, that side developed muscle tone, and his proportions grew more balanced. Snake never lost his limp, but he could run and play and he had to spend less and less time lying down. His first paddock mate was A. P. Slew. An EPM recoverer, the little red horse didn’t push Snakey too hard physically. Soon it was Snake who began pushing A. P. Slew, though the older, more experienced horse was obviously Snake’s role model, providing needed socialization. Though Snakey copied A. P. Slew, he had his own style with visitors to the farm, an in-your-face, trusting eagerness that won hearts—and, oh boy! treats! Oh, the joy of friends and goodies! APS and Snakey on a May evening, 2013. Photo by Laura Battles. Snake had nothing to offer? What about the time A. P. Slew cribbed their paddock gate off its hinges and Jack Horner-like (“what a good boy am I!”) stayed inside, while Escapedfrommypaddock! ran up and down the runs between the neighboring paddocks partying with everybody so that a good time was had by all? We closed the back gate to keep him there, but he could still have been hard to catch. Instead, when told the party was over, he willingly allowed himself to be led back to his own paddock. To him, it was all good. As he grew in strength, Snake needed more energetic paddock mates. This year he got them, and the last year of his life was his happiest. Not quite ten years old, he had tons of energy and could keep up with pretty much anybody. He was introduced to Commentator and Fabulous Strike, along with veteran claimer Marshall Rooster. Commentator is one smart cookie. He can come on strong, and on the track he could be merciless to his competitors. Vosburgh winner Fabulous Strike is no pushover, either. Snakey was always just a bit of a foal. But what do you know, Commentator decided Mr. Snake was one cool dude. Fabulous Strike followed suit, and Marshall Rooster too. 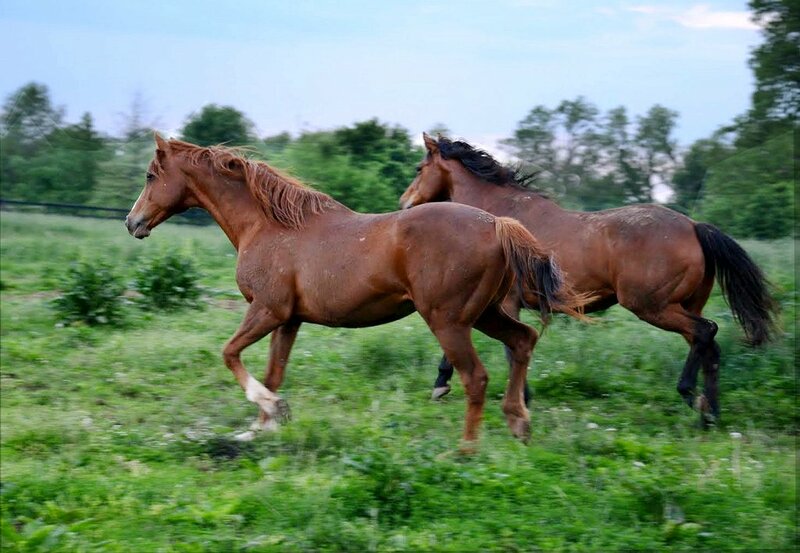 Escapedfromnewyork became the golden boy of the herd, liked by all, the one who’d start the play going, and then they’d all race up and down the long, sloping paddock, or wrestle, or join in all the games that youngish geldings, like teenage boys, love to play. 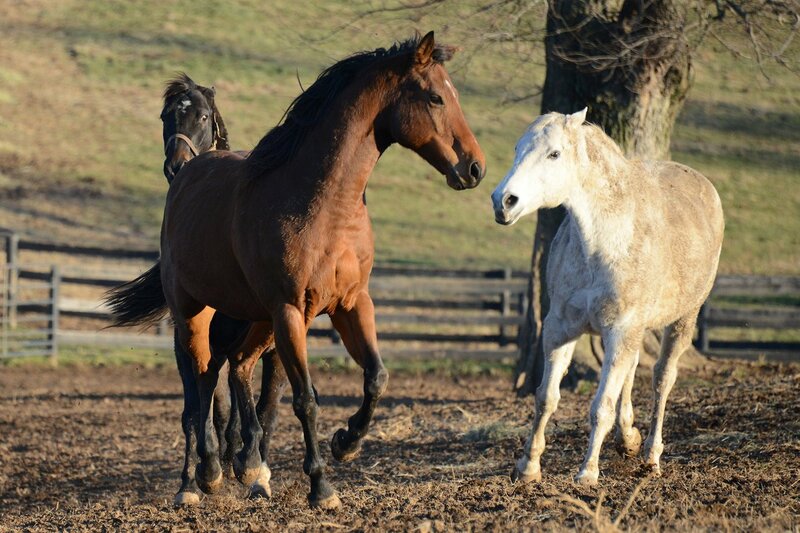 Snake, Marshall Rooster and Fabulous Strike, dinner time play, November 2014. Photo by Laura Battles. A horse like Escapedfromnewyork has nothing to offer? Of course, his story made him an important part of our fundraising family. But on the farm, what stood out was that in the too-short-years between his arrival in April 2009 and his fatal, colic-related, heart attack on January 18, 2015, Escapedfromnewyork gave us the delights of his discoveries and recovery, affection, laughter, and the cheerful trust of a heart that—whether or not affected by his early deprivation, and that we’ll never know—was open to people and horses alike, a kind heart that always looked for the positive and found the good in life. At last night’s Eclipse Awards ceremony Michael accepted a special Eclipse Award on behalf of Old Friends. In receiving horse racing’s highest honor for 2014, we are proud to be in the company of legendary race caller Tom Durkin and Barbara Livingston whose photographs have done so much to connect the spectators with the horses, and who has taken so many magical and memorable photos of our horses. We love it that Rosie Napravnik presented Old Friends’ award. 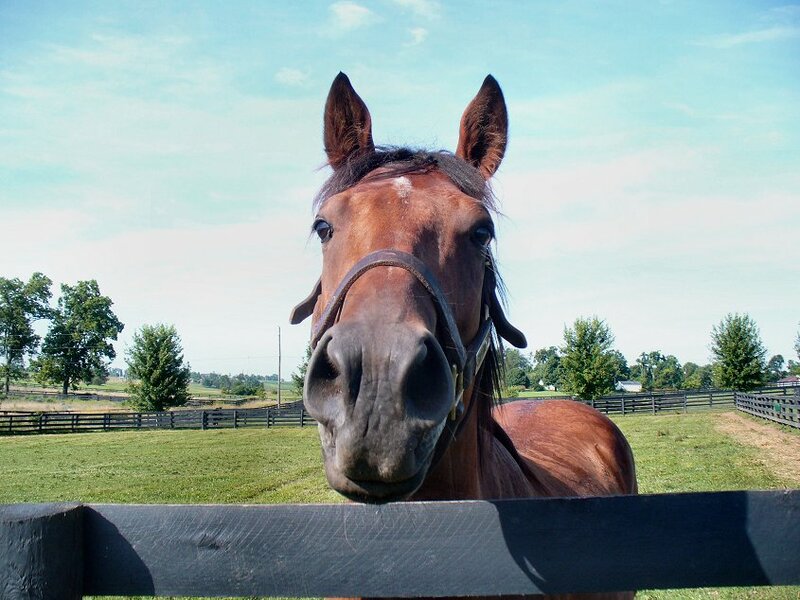 As wonderful as so many people in racing are, and as many humans contribute in many ways to Old Friends’ existence and continuation, this Eclipse Award is – above all – an acknowledgment of the horses. Along with Horse of the Year California Chrome and the other champions of 2014, Gulch and Ogygian got rounds of applause. It’s not just because they’re 31 and 32. It’s for all they and their fellow retirees have done for racing, some of them on the track and in the breeding shed, all of them for the important work they are now doing. Whether they are Silver Charm, Game On Dude, the hardworking claimer Marshall Rooster, or Escapedfromnewyork who was never capable of racing, these horses, individually and all together, embody the courage, athleticism, intelligence, and willingness to give their utmost, that distinguishes these beautiful animals. The Eclipse Award conferred on Old Friends last night recognizes staff and volunteers’ dedication and hard work and supporters’ caring and generosity. But even more, it acknowledges the awareness of the voting press, racing fans and racing participants, that the horses matter. Successful or not. Young or old. That however greatly humans contribute to the sport, horse racing is the horses. 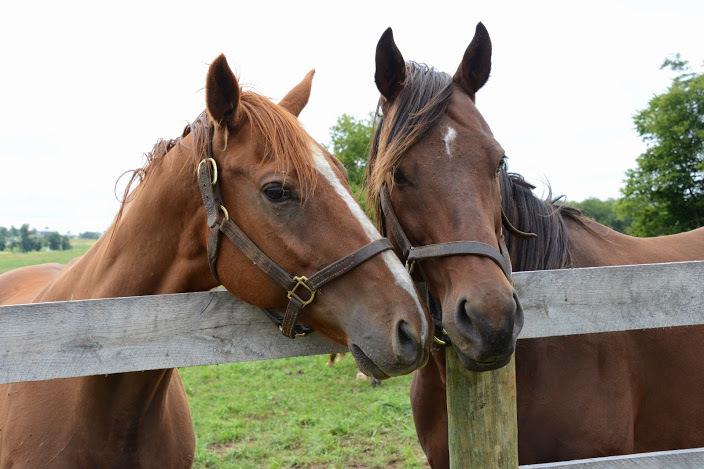 We congratulate the horses of Old Friends on their important contribution toward the well-being of all Thoroughbreds, every time they look a visitor in the eye, amble over to give a fan who loves them the gift of their presence, pose for a photo that gets retweeted, or just nibble their hay and enjoy the mild winter sun. They are history. They are today’s spirited or relaxed enjoyment of life. They are horse racing. Thunder Rumble 1989-2015. Photo by Connie Bush. 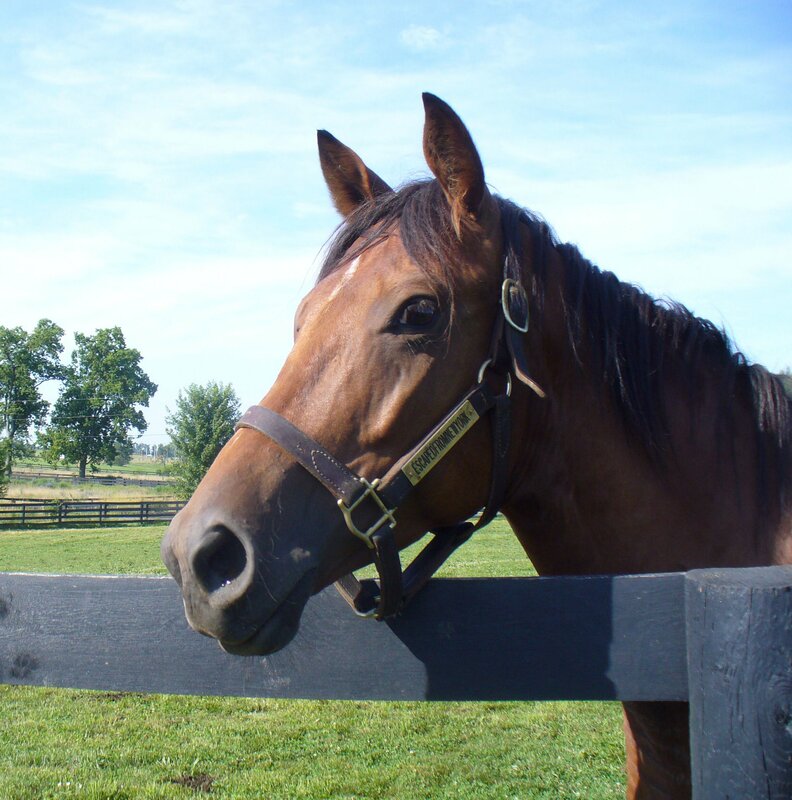 Here in Kentucky, our hearts are with Joann, and the volunteers at Old Friends in New York, and all the visitors, who loved Thunder Rumble. 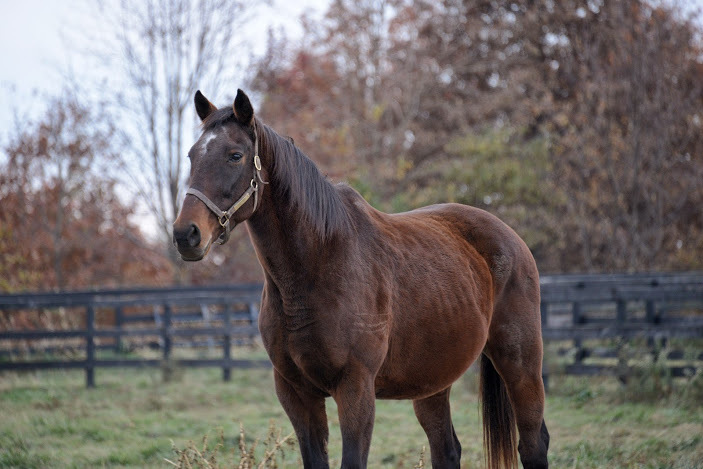 The magnificent star of Cabin Creek Farm died January 6 from complications due to colic. Thunder was an impressive horse, intelligent, dominant, high spirited, yet a loving, loyal friend. His bond with Joann was clearly an extraordinary one, the kind that a horse person can wait a lifetime for. 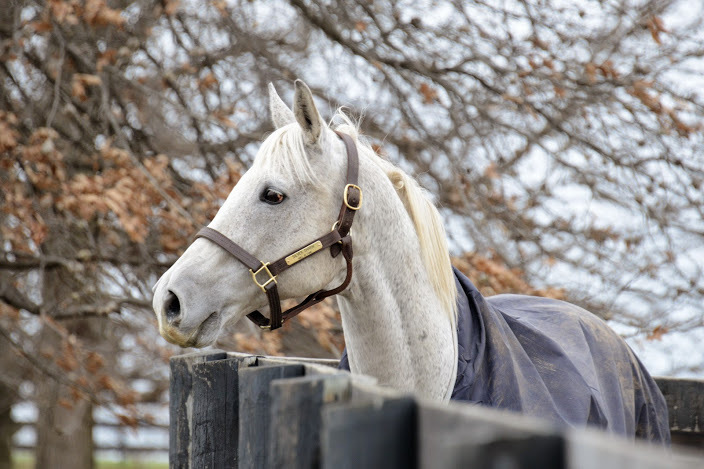 While there are many wonderful horses at the New York farm, and even another Travers winner, Thunder Rumble seemed to be the spirit of Cabin Creek. My love to all who were fortunate to be part of his life.